This site is hosted at no cost to the public by JewishGen, Inc., a non-profit corporation. If you feel there is a benefit to you in accessing this site, your JewishGen-erosity is appreciated. These pages are an introduction to the ancient Ukrainian city of Kamyanets-Podilskyy (Kamenets)*, and to the Jewish community that lived there. Kamenets was an ancient and important centre of Jewish life but its unique history is overwhelmed by the terrible fact that in the forests outside Kamenets was the location of the first recorded mass murder of Jewish people in the Second World War. The earliest mention of the city was in an Armenian chronicle of the 11th century but recent archaeological research suggests that its history goes back many thousands of years. It was always of strategic and trading importance, being located approximately 10 miles away from the River Dniester, which separates Podolia and the Ukraine from Moldova, and being also close to the traditional border with Eastern Galicia. The city’s ‘old town’ sits on a high plateau (part of the Carpathian mountains) within a loop formed by the River Smotrych. It had six suburbs, which were built on and below the cliffs that surrounded the plateau, and these were connected by three bridges. Located there are centuries-old narrow, winding streets and ancient buildings, the Turkish fort (which was separated from the rest of the town by a deep ravine and controlled access to the old town), remnants of the city walls, several towers, and the fortified Russian and Polish gates. To the Jewish people, who at times constituted 50% of the population, the city was know as Kamenets, a bustling, large market place and regional trade centre, a cradle of Chassidic Judaism, and a regional centre for the development of Jewish culture and Jewish politics of the late 19th and early 20th century. Although the Jewish community was substantially destroyed in the Shoah, there are remnants of the Jewish presence, including the restored façades of the Great Tailors Synagogue (Реміснича синагога/Remisnycha Synagogue) and the Honchar (Potter’s) Tower and many houses and shops in which Jewish families lived and worked. There is also a reported small Jewish community (said to be about 500 individuals) still within the city but recent efforts to make contact with them have been unsuccessful. Jewish inhabitants were first noted in 1447 . In 1598, after first granting Jews freedoms and rights, the Polish King Sigismund III prohibited Jews from settling in the town and suburbs and from engaging in trade there. Jewish residents were forced to live in outlying villages and their visits to their home-town were theoretically restricted to three days duration. Over the centuries this uneasy relationship between the authorities and its Jewish community was maintained. Very often there was opposition to the Jewish community caused by some external commercial, political or religious issue; which prompted a prohibition or restriction on the Jewish community and, at its worst, pogroms. Research suggests that Kamenets was the centre of Jewish population from where Jews spread north through the Russian Empire . A jumping off point for a form of Judaism introduced from the east, via the Turkish Ottoman empire. The Jewish community of Kamenets was influenced by this in religious practice and this was most obvious in the Sephardic liturgy used by most ‘Kamenetsers’ in their daily prayers . This in turn is thought to have been an influence on the development of the Chassidic liturgy (the foundations of which can be attributed to the Jewish community of Podolia (being the birth place of the Baal Shem Tov) . So, for the Jews of Kamenets, where east met west, distinctions between Sephardi, Ashkenazi and Mizrachi Jews had little relevance; unless, of course, you attended the small Ashkenazi synagogue. Jewish life was about family and community affiliation - the family being your extended family network and the community affiliation could be the area of Kamenets that you lived in - the Old Karavansary, the town or one of the suburbs -the synagogue you were a member of, the rabbi you followed, your trade or profession or, in later years, your political party. To quote from a translation of Gedalia Bernstein’s introduction to the Sefer Va’ad Hakhamim (published in Warsaw in 1900). 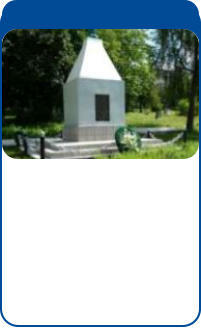 The memorial to the victims of the Shoah (Holocaust) in the Kamenets Jewish cemetery which was erected by the small surviving Jewish community of the city in the 1950’s - photo courtesy of Michael Wyman 2010. * The city is know by a number of names - as can be seen in the facts section of this page. Throughout this site the name given is the Jewish names for the city; that is either Kamenets or Kamenets-Podolsk.